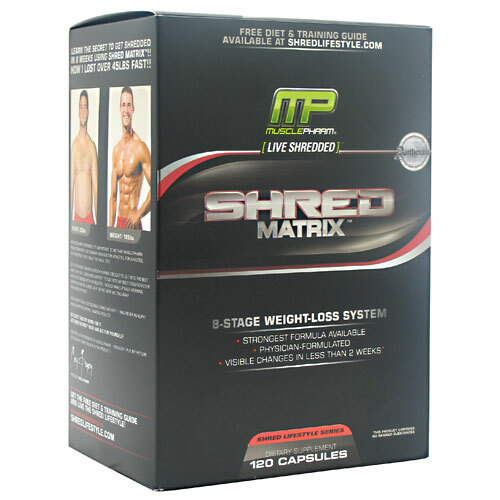 SHRED MATRIX® is MusclePharm®’s powerful weight loss system. SHRED MATRIX® is unique — utilizing a comprehensive, multi-system approach to fat loss. Powerful, but safe and effective for both men and women, SHRED MATRIX® utilizes the body’s multiple energy pathways and systems to promote aggressive mobilization of fat to be burned for fuel. SHRED MATRIX® also addresses all the key issues that make fat loss difficult in the first place. SHRED MATRIX® supports improved energy and alertness, enhances mood and mental function, and helps promote appetite regulation. STAGES 1 AND 2: Increase Energy and Ramp Up Metabolism. STAGES 3 AND 4: Crush Hunger. STAGE 5: Balance Mood and Enhance Well-Being. STAGE 6: Razor-Sharp Mental Focus Support Without Jitters. STAGE 7: Eliminate Excess Water. STAGE 8: Sugar Stop™ and Enzyme Aid Matrix.